This enchanting box has been created by the youngest of Molodkin brothers, Nikolay Molodkin. He is a very talented artist whose works are as unique as the works of his father and brothers. 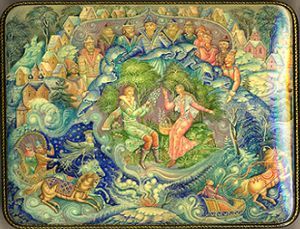 In this work the artist has chosen to depict a recognizable moment from the classic Russian fairy-tale of Twelve months. In the center of the composition Twelve months help the girl to pick snowdrops (spring flowers). They have changed the seasons and now she can fill her basket to overflowing with snowdrops. The style is similar to the style of his father, Vladimir Molodkin. A soothing palette of cool, crisp tones brings winter's imagery to life. Various shades of green help the artist to express the idea of summer in the center of the composition. The brushwork is exquisite, which is enhanced by the hairline gold detailing he adds. This piece shows that geometrical, artistic, and technical exploitation, when in perfect harmony can yield tremendous results. The scene is framed with a very thin gold line. The edges of the lid are adorned with gold foliage pattern. The similar gold foliage pattern but a little bigger in size can be found wrapping around the box's sides. The box is constructed from paper-mache. Black lacquer is used to paint the exterior of the box while red lacquer completes the interior of the work. A hinge is fastened to the top of the composition, and the box rests on a flat bottom. The work is signed with the artist's name, Mstera, the title and the year of 2008 on the lid's interior within a beautiful pattern.